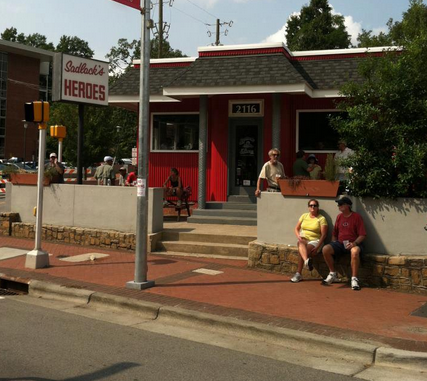 Sadlack’s Heroes, where Ryan Adams first got Whiskeytown together back in 1994 (see chapter four of “Losering”), has been shut down for more than four months now. Ever since the Backsliders closed it out on new years eve, the building has stood empty, silent and boarded up while awaiting demolition to make way for a 135-room hotel project that will occupy Hillsborough Street’s Bell Tower Block. As of this week, alas, we can’t even say that the building is standing anymore. Wrecking crews began taking down Sadlack’s and the adjacent structures in recent days, starting with the Hillsborough/Enterprise corner that Sadlack’s occupied. Below left is a picture from the Sadlack’s Facebook page, taken in August 2012; and below right is the same scene on Saturday, May 3. Between traffic on the street and the construction fence, I couldn’t capture quite the same angle. But you can use the Sadlack’s sign to orient the view for comparative purposes; clicking on either picture will enlarge it. You can also see a much better picture of the scene here (taken from the other direction). As of Saturday afternoon, it didn’t appear that they’re working over the weekend. But I’d guess the entire lot will be cleared off and all the debris cleared away by the end of next week. 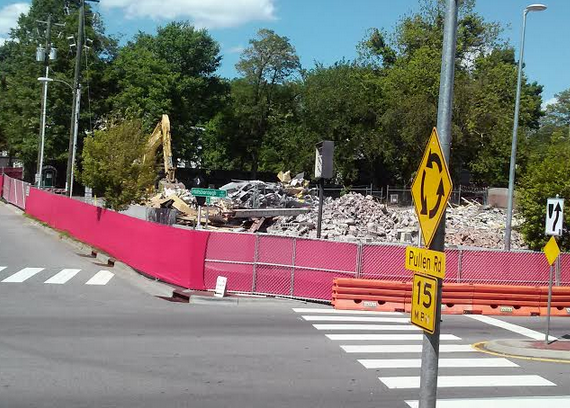 And then the last vestiges of one of Ryan’s signature Whiskeytown-era Raleigh landmarks will be well and truly gone. I sing of Saturday night down at Sadlack’s in the eighth level of hell, for there I was brought upon the great car of Night to bear witness of the plight of the damned who reside interred between enterprise street and engineering drive consuming the slow waters of the lethian grain from all nations. SKIL’T Scylding ignores a fight breaking out to disturb the regular consumption of hoppy opiates. Empty bottles clatter into large rubbermaid garbage bucket orifices…or miss. Becks, Duvel, Heinekin…Crash. The Von Schlieffan Plan. Monster non-sequitur fist pulvorizes corrugated (tin?) and a big hole in the ceiling is there. The radio is playing surfspaghettiwestern. No incisors. Why is she with him? The Mighty Joe Young lectures on, beats on the bar and thumps the padded stools. While he rages, he rages on by himself to no one in particular and to everyone in general. It’s all girls behind the bar, no one to fight. No you cannot pay with a three dollar bill with clinton on it. At any given time sadlacks is 25% staff off duty and 25% ex or soon-to-be/potentially ex-english students, grad, undergrad and under-the-table.